Fast, Affordable Gate Repair in Manhattan Beach. It's the Everest Way. Perform the Best Quality Work – Our technicians have received the highest training in the industry. We can work on all gate types, and make and models of openers and gate accessories. We only use high quality parts and products because we stand strong behind our reputation. Low Cost – Gate repair, new gates, and custom gates can rack up a hefty expense. Everest wanted to change that. Our overhead is low, so we can offer the cheapest price on gate repair in Manhattan Beach, guaranteed. Best Customer Service – When Everest first opened its door our business model began with this promise: to offer a class of customer care unlike anything a customer will ever see. Our Manhattan Beach gate repair team doesn’t just smile while being prompt and polite; we form relationships with our clients and have a deep love for this special community. Everest treats customers like family. Family Owned for 10+ Years – When you call a family-owned gate repair company that has been in business for more than a decade, you know you are reaching out to a trusted name that has been doing it right. Family matters to us, including yours. When your electric gate won’t open, or your driveway gate is stuck, call Everest and let our friendly technicians come out and perform a comprehensive diagnosis before fixing it like new again. Why do Driveway Gates Break? Driveway gates can break from years of wear and tear just like your dishwasher. In fact, we’ll be direct: driveway gates break all the time. Depending on the quality of your gate, it has a life expectancy based on the number of cycles it performs, and how strong its vital parts are. For example, any low-end manufactured gate from a big box store will have a significantly lower lifespan than a custom gate made by a local company. 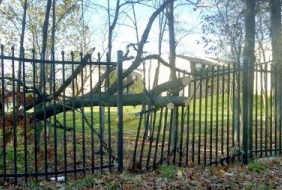 Gates can also break to no fault of their own: a fallen tree or your teenage daughter driving smack into it can do significant damage. Another cause that, as strange as it sounds does happen, includes rodents chewing through wires in your panel or gate opener. Sometimes gates only appear to be broken requiring a simple quick-fix. For example, sometimes rodents will crawl into the opener’s housing and build nests that block sensors. Then there are homeowners who think their gate is broken, but all they need to do is replace the batteries in their opener. If your gate won’t open or close, check inside the tracks to see if there is any debris preventing the movement. If you have kids it is not uncommon for toys, baseballs, and frisbees to get wedged in there. You should also check the electric eyes; if they need to be replaced you can get them at most home improvement stores for around $50. If you still can’t figure out the culprit, call our Manhattan Beach gate repair experts; we will get down tot he bottom of things and repair your driveway gate in no time. Call us for Repairs, Maintenance, or for a new Custom Gate! What kind of online reviews do they have? Do they offer additional services, thus showing they are true specialists? How do their prices compare to others? How quickly can they arrive to your property? What are their community ties? Everest is, without a doubt, the go-too Manhattan Beach gate repair company for homes and businesses alike because we get an A+ on these points, and on others. Whether you have a large gate protecting your home off Ocean Drive, or a business off Manhattan Beach Blvd that requires immediate gate repairs, call Everest and experience the best service in the industry! Best Quality – Our custom gates are made from materials that have been hand-sourced by the production crew so that we can inspect the quality and integrity before purchase. Then our master woodworkers and metalworkers use their advanced training to perform flawless welds. Intricate designs and ornamentation are completed by artists on staff, giving you a gate of superior quality and beauty that will last 10 times longer than any manufactured gate. Low Cost – Opulence doesn’t have to be expensive. Everest offers low cost Manhattan Beach custom gates because our overhead is low and we like to pass the savings on to the customer. Because our gates are produced on-site, we source our own materials, and use our own craftsmen, you pay a lower price and still get supreme quality. Anything You Want. Do you need a driveway gate, electric gate, pool gate, or swing gate? What about modern, Victorian, Gothic, rustic, or contemporary? We make all gate types, of any size, any style, and from any materials you want. Access to all Materials – Metal and wood gates are the most popular, and sometimes we mix the two materials together. We have oak, pine, teak, walnut, cedar, bamboo, cherry, birch and even reclaimed wood. Some of the metal we use includes iron, bronze, copper, brass, wrought iron, steel, aluminum, and tin. We can even include glass, mosaic tiles, and concrete. 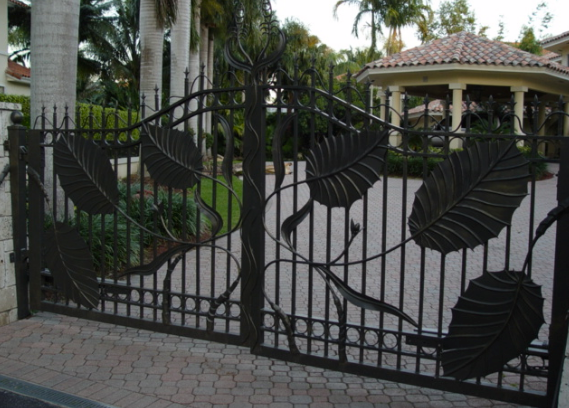 Do you have a design in mind for your new custom gate? Our creative team can take your design and make it a reality, or we can create our own design based on your requirements. Once you have signed off on the approval we get right to work creating your functional work of art that will be the envy of your street. Call Everest today, and ask us what the current wait time is to have your gate created and installed. Never put off getting your broken gate fixed; Everest is a reliable, well-known Manhattan Beach gate repair company with hundreds of satisfied customers, and we stand behind our good work and reputation. When your electric gate breaks you can contact Everest and know that you will get a low price quote from friendly and caring professionals who perform exceptional work. Let our family-owned business bring peace of mind to your family; call today and prepare for the best service experience of your life!